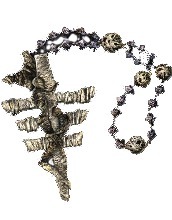 Rosaria's Fingers is a hostile covenant that revolves around Player vs Player combat though the use of red eye orbs, cracked red eye orbs and red-soap stones. They are dedicated entirely to hunting and killing other players for their Embers. You are rewarded with Pale Tongues for defeating a host in their world which can be used to change your appearance or your stats. It is theorized that Rosaria is daughter of Queen Lothric(Gwynevere) due to the miracle you receive when transmuting her soul, some speculate her to be Gertrude.